A new study by Virginia Commonwealth University researchers suggests that dysregulation in the way two G protein-coupled receptors talk to each other may be responsible for some symptoms of schizophrenia and could lead to new treatment targets. The study "Allosteric signaling through an mGlu2 and 5-HT2A heteromeric receptor complex and its potential contribution to schizophrenia," was published in the journal Science Signaling in January. GPCRs are proteins that sense signaling molecules such as hormones and neurotransmitters and are the targets of many prescribed drugs. Healthy brain function relies on GPCR signaling, and alterations in this process can result in various diseases and ailments, including hypertension, diabetes and pain, as well as neurological and psychiatric disorders. In this case, researchers analyzed the structure of two GPCRs involved in schizophrenia and antipsychotic drug action: serotonin 5-HT2A and glutamate mGlu2. Until relatively recently, these GPCRs were assumed to function as monomeric signaling units. Monomers are proteins made up of a single polypeptide chain. In a 2008 study published in Nature by the same team, researchers discovered that these two GPCRs were actually assembled as heteromeric complexes, which contain two or more polypeptide chains, and are located in close molecular proximity at the cell surface. This structure functions in a different way than the monomeric complex and changes the way therapeutic drugs affect it, too. Building on that knowledge, researchers in the new study were able to characterize the mechanism for how 5-HT2A and mGlu2 crosstalk within the receptor complex and show that this crosstalk is altered in both lab mice and postmortem brain tissue samples of schizophrenic patients. "We found that if you activate only the mGlu2 receptor in single cells expressing both mGlu2 and 5-HT2A, you have both Gi signaling and Gq signaling," said Javier González-Maeso, Ph.D., associate professor in the Department of Physiology and Biophysics at the VCU School of Medicine. However, when you activate the mGlu2 receptor in animals without the serotonin 5-HT2A receptor, Gq signaling doesn't occur. The brain tissue samples of schizophrenic patients indicated the same thing: Gi signaling but no Gq signaling. Gi and Gq are molecules that control how each cell decodes the various signals coming from the GPCRs. Previous studies have shown that a specific ratio of Gi versus Gq signaling is necessary to induce antipsychotic responses in mouse models of schizophrenia. "Our findings suggest that this crosstalk is changed in patients with schizophrenia and might be responsible for some of the symptoms," González-Maeso said. Knowing this, researchers can consider new therapies for schizophrenia. Current treatment addresses symptoms through drugs that target one receptor. Often, these drugs either do not work or patients have severe secondary effects. About 74 percent of patients end treatment, according to González-Maeso. "With these new findings, we set the stage for new pharmacological approaches that will allow us to balance Gi and Gq signaling with the final goal of developing new therapeutic strategies for schizophrenia treatment," González-Maeso said. Schizophrenia is a mental illness that affects 1 percent of the U.S. population. The disease interferes with cognitive function, managing emotions and social interactions. 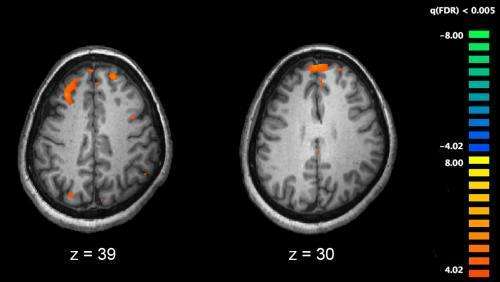 Risk factors for schizophrenia include genetics, environment and brain chemistry.